Allan Vorda: Discuss what is referred to as the “profound economic impact” (p. 130, Note #3.18.10a and Appendix F) of the wealth that Alexander obtained from two centuries of Persian taxation. What happened to all of this wealth after Alexander’s death? James Romm: Much of it was drawn on by his successors to fund their wars against one another. The wastage was terrible. This story is told in more detail in a forthcoming book of mine, Ghost on the Throne: The Death of Alexander the Great and the War for Crown and Empire, appearing about a year from now. AV: During various encounters of the Macedonians with foreign troops who had different languages, there is no mention of how they were able to communicate during meetings, surrenders, and truces. What do you know about how the Macedonians were able to communicate with their enemies or these “barbarians” as Arrian refers to them? JR: Arrian does refer at various points to the need for interpreters. No Macedonians learned the language of their subjects except Peukestas, who taught himself Persian. Alexander had Greek taught to the Persians he expected to become part of his imperial regime. AV: Arrian does not refer to vulgate sources about thirteen days of sexual congress that Alexander allegedly had with an Amazon queen named Thalestris (p. 141, Note #3.25.1a) who wanted to have his child. Plutrach rejects this as a fiction. What do you think? JR: I agree with Plutarch. Arrian was quite sensible to omit this story. AV: During Alexander’s campaign which lasted approximately ten years, there had to be a sizeable number of troops killed or severely wounded. How did Alexander replenish his troops? JR: Alexander sent back home for reinforcements on several occasions. But his losses in battle were very small compared to the other drain on his manpower, the posting of garrison forces to retain conquered territory. AV: There is mention of Alexander’s barbarous treatment of Bessos who betrayed Darius. Reportedly, Alexander had Bessos’ nose and the tips of his ears cut off before being executed. Please comment on another example of Alexander’s cruelty and how factual it is. JR: Even Arrian records this mutilation, so there is no reason to doubt it. 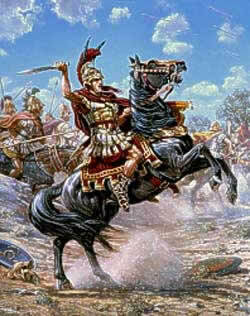 As I said above, Alexander was capable of great cruelty against those who resisted him with determination. AV: During the episode of Bessos, it appears that Alexander’s drinking was getting out of hand. Shortly thereafter, Alexander kills Kleitos (whose sister nursed Alexander as a boy) in a drunken rage. What are your thoughts on this episode in which Arrian deplores Kleitos’ behavior and ultimately praises Alexander for his subsequent grief? JR: Arrian wants to exculpate Alexander wherever possible. He obviously can’t excuse the murder of Kleitos, but he manages to assign equal blame to Kleitos and to Alexander, and then to praise Alexander for his remorse. It’s a pretty generous treatment, but he does ultimately chalk the episode as a black mark against Alexander, not least because the king was drinking to excess. AV: After Alexander defeats the Sogdians and their leader, Oxyartes, he marries (p. 178) the beautiful Rhoxane. She is the virgin daughter of Oxyartes and considered the most beautiful woman, other than Darius’ wife, in Asia. Tell us about Rhoxane, the child she bore Alexander, and her ultimate fate. JR: This is another story that is told in detail in my forthcoming Ghost in the Throne. It’s a tragic tale. Rhoxane was in her early teens when Alexander married her, perhaps about twenty when he died and pregnant with his only legitimate child. Eventually she gave birth to a boy, Alexander IV, who immediately became one of two crowned heads of state, sharing the kingship with his uncle, Philip III. For thirteen years thereafter Rhoxane and her son were pawns in the power struggle for control of the empire, controlled by no fewer than five of the Successors at various times. Eventually mother and son became prisoners of Kassandros, who kept them in seclusion for six years before having them secretly assassinated. None of the Successors at that point wanted a legitimate monarch to assume power. AV: Arrian (p. 197) states: “Of course, one must not examine ancient tales about the divine too minutely. For stories that strike a listener as incredible because they violate our sense of what is probable begin to seem credible when an element of the divine is added.” Despite the allusion to Alexander’s divinity, this statement could easily apply to Arrian’s over-the-top tributes to Alexander’s greatness as violating the reader’s sense as to what is actually credible. JR: Arrian speaks here of tales that rely on the divine as an explanation, and, to his credit, he mostly avoids this in his own narrative. He does believe that the gods were somehow involved in Alexander’s success, but never attributes any historical event to their influence. The closest he comes is the statement that some god induced Darius to change his ground before the battle of Issos, because it had been foretold that Persia would fall. But even here Arrian says “perhaps.” He’s no Thucydides, but within the context of ancient historiography, he’s fairly rigorous about excluding supernatural factors. AV: Koinos makes an impassioned speech to Alexander that the troops are tired and want to go home to which Alexander eventually agrees. What was the state of Alexander’s army at this point in time as they had already reached the Hyphasis River in India? JR: Both their gear and their morale were in pretty bad shape. They had marched for months through monsoon rains and tropical heat. One of our sources reports that, when they received new armor and clothing in India, they burned the ones they had. But the biggest factor motivating the mutiny was their fear of war elephants; they knew that if they went on eastward toward the Ganges, they would have to fight a lot more of these.